Search for learners, see what they have completed, and find grades and feedback for each learner. 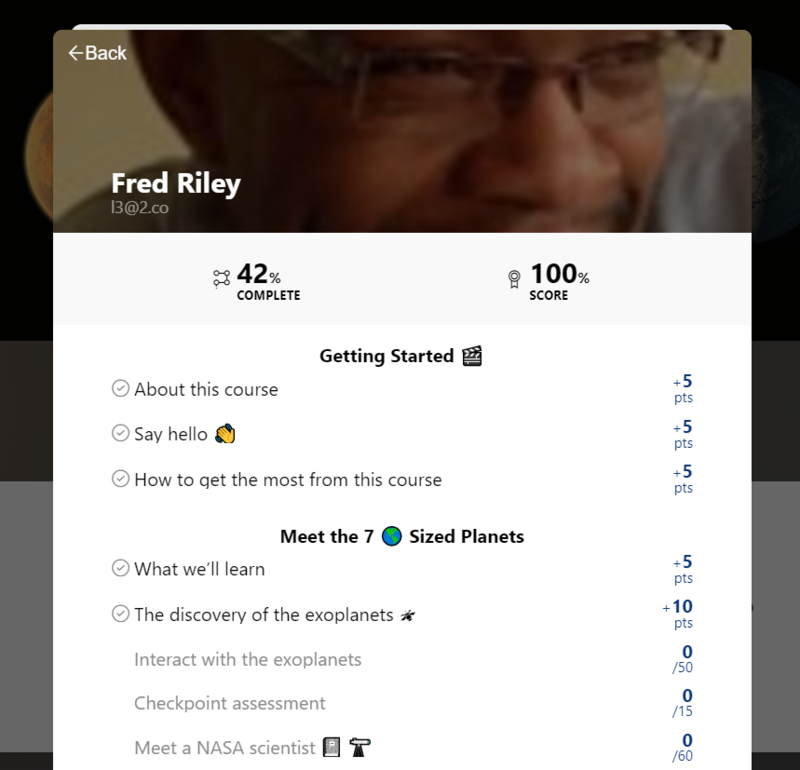 If you are teaching or moderating a group of learners, you'll want to see at a glance how the class is doing as a whole, but you'll also want to drill down and see how Bill did on the last project. Quickly view the stats on the entire class and review or grade a single user with the learner manager and report cards. Open the learner manager by selecting "View learners" from the Settings menu or from the View Learners button on the right. When you open that up, you'll be able to view all learners or use the search and filter features at the top to narrow your results. Select a learner to open a detailed report card. You'll see what percentage of the Path the learner has completed and if you're using points, what his current score is based on the steps completed and graded so far. Learn how to add a point value to steps here if you haven't set that up yet. You can select any step title from the report card to open the review panel for that learner's completion of that particular step. You'll be able to review any work submitted on the step and give feedback or review feedback that you provided earlier. This is a good way to quickly see how an individual is doing. Simply close the panel and click on another step to work through a single learner's work. Learners will be notified about feedback by instant email notification and can view feedback by email and within the platform. See more on reviewing learners' work and providing feedback here. If you would like to have extended private conversation with any learner, you can find their email address from the View Learners screen to the right of their name under the additional actions (...) icon. Click or tap on the email address to send an email to that individual. Right-click or hold to copy the email address. Threaded private feedback inside the platform is coming soon. To download learner information or your full grade book, open the additional options and select a report to download. The grade book will download as CSV file that can be imported into many other apps and systems. 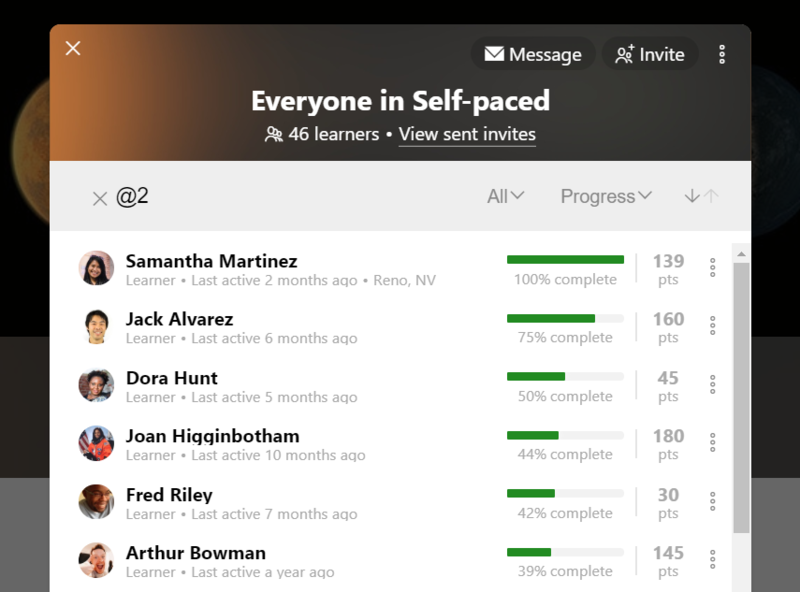 Learners will be able to see only their own report card by selecting their "Performance" icon at the top of the Path.